Cutting the meat into 1″ wide and 1/8″ thick strips, be sure and trim all fat. In a ziploc, mix ingredients. Dump in the meat, close and shake up coating each piece. Refrigerate overnight but move the bag/marinade around occasionally. Preheat oven to 160 degrees and lay out strips on foil without touching and dry out anywhere from 6-8 hours, or to your preference, with the oven door propped open for ventilation. Enjoy! This was excellent. I added a teaspoon of cayenne pepper to the mix. 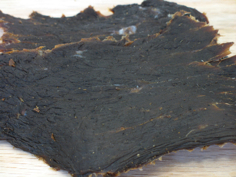 Just don’t make the mistake of taking the jerky to work with you or you’ll have to make another batch real soon!